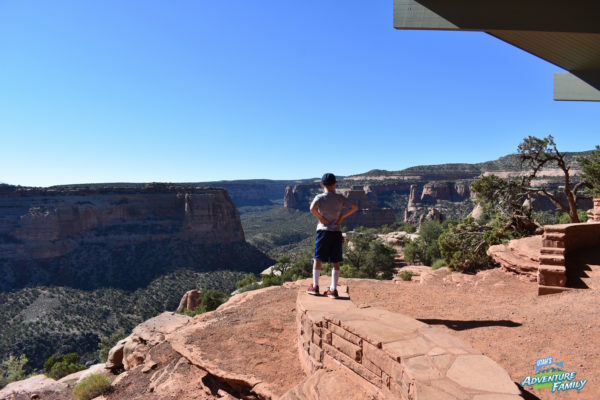 We were impressed with the views at Colorado National Monument. 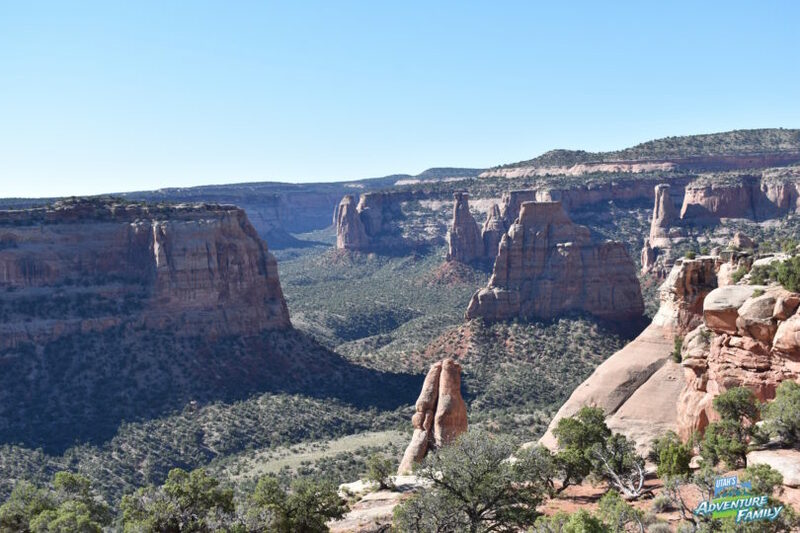 Colorado National Monument is like a miniature Zion Canyon located just outside Grand Junction Colorado. 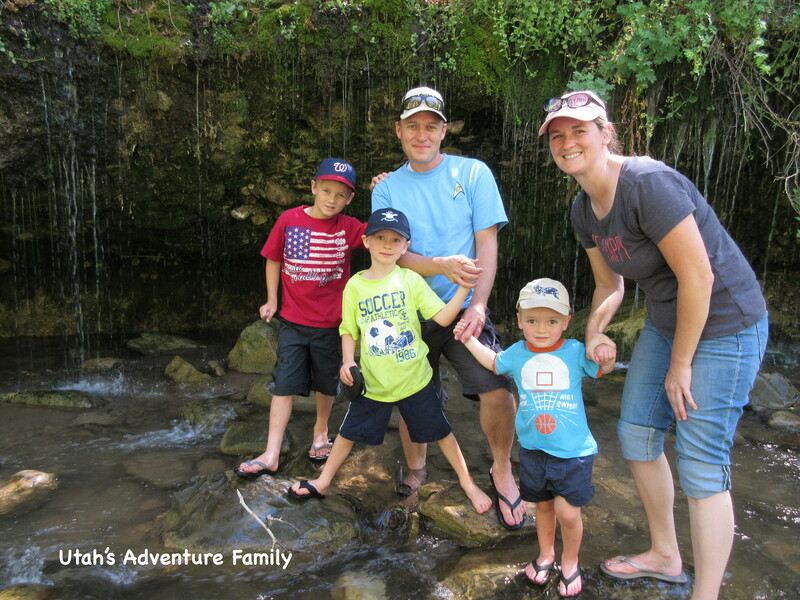 There are beautiful red rocks, a large canyon with a scenic drive, and several hiking trails. 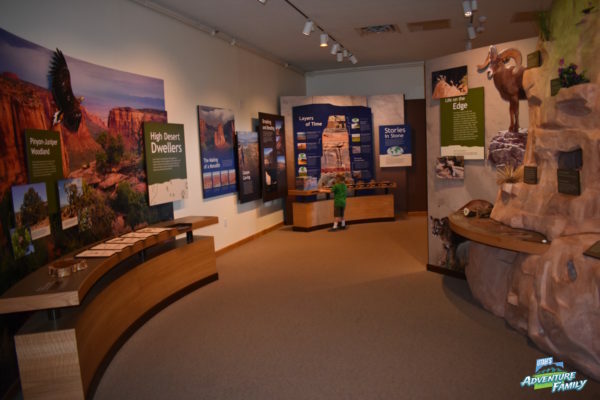 You can even camp in the monument, and there is a small Visitor’s Center with a Junior Ranger Program. The Monument was created over a hundred years ago back in 1911. When we visited in 2017 we could see the reason this land has been set aside. 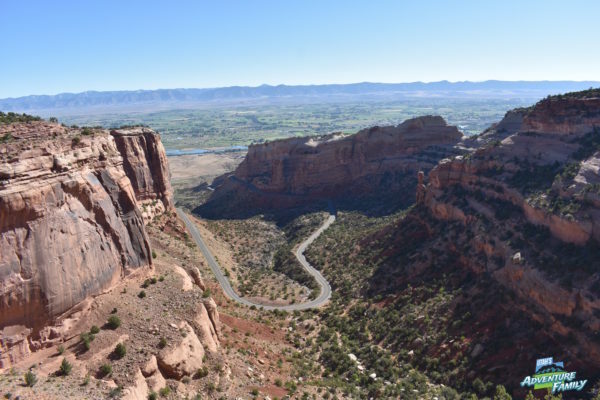 A winding road takes you up the canyon to the top of the mesa. 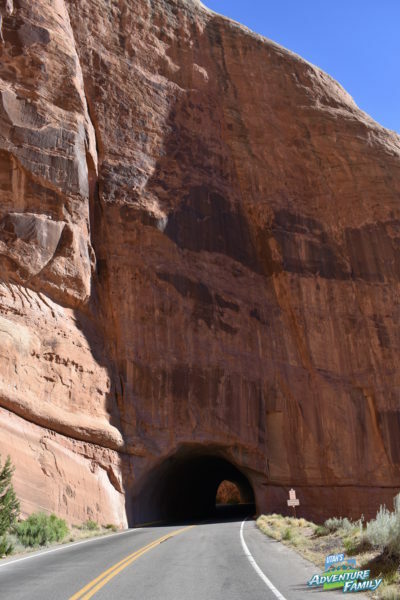 On the way you pass through several tunnels carved out of the sandstone. 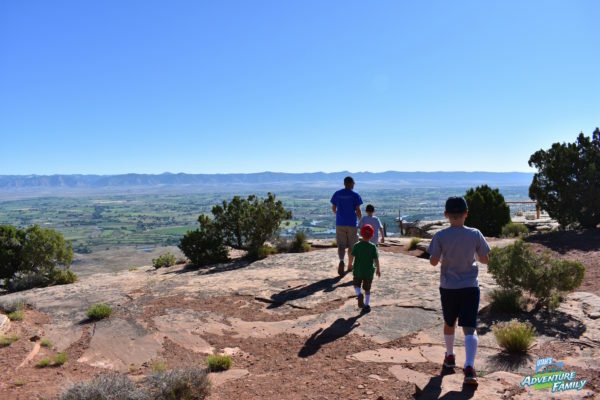 Once on top of the mesa, you may see bighorn sheep, mule deer, or even coyotes. The road winds around the mesa and explores many overlooks. 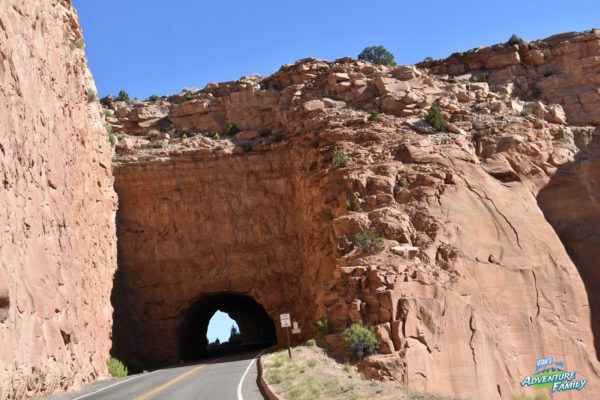 There are unique rock formations along the entire drive through the national monument. The tunnels are one of the highlights of the trip. We had to double check that our motorhome could make it through the tunnels, so if you have a large rig, ask a ranger. 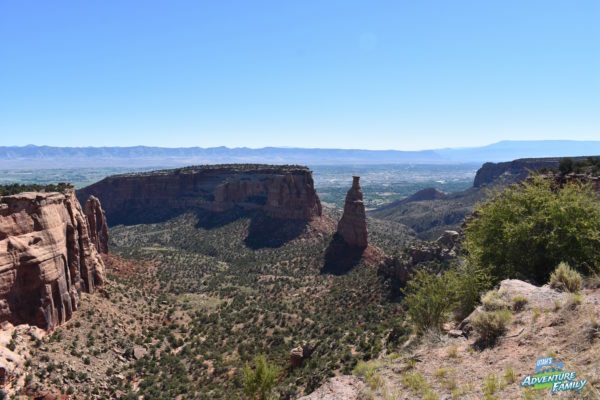 The road climbs up through Colorado National Monument to the top of the mesa. We stopped for a hike called Window Rock. 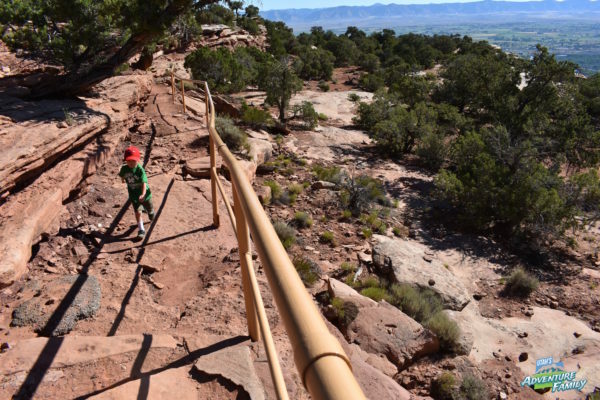 This short one-miler led out along the canyon rim to a very nice overlook. 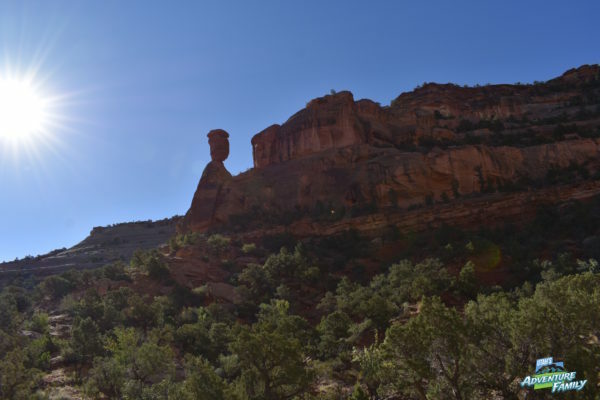 In the canyon are towering sandstone towers that reminded us a bit of Monument Valley or Zion. 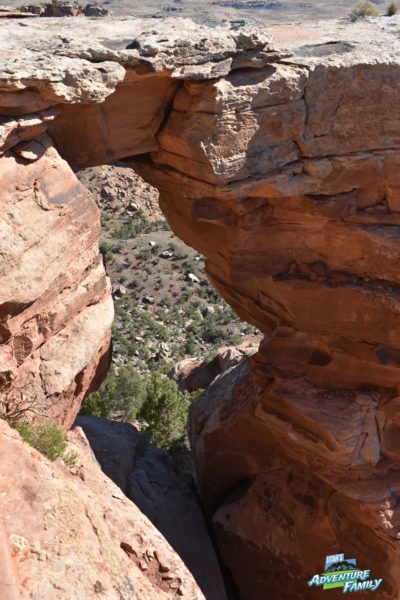 Window Rock is an arch that is right along the canyon rim. Many of the rock formations have special names, too. Our boys enjoyed spotting lizards along the trail as we hiked. The trail is mostly flat and easy. Keep an eye on the kids because there are some drops along the trail. The trail walks along the slick rock most of the time. 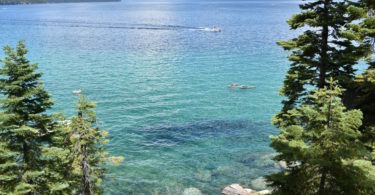 The view at the end of the trail is gorgeous. Window Rock is right against the canyon wall. The view by Window Arch reminds us so much of Zion. 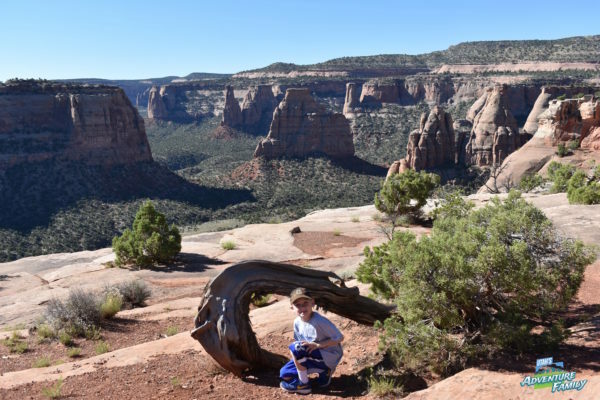 Our 8 year-old found another arch! The Visitor Center is small, but there is an interesting movie and a small museum. We spent about 45 minutes before moving on down the road. 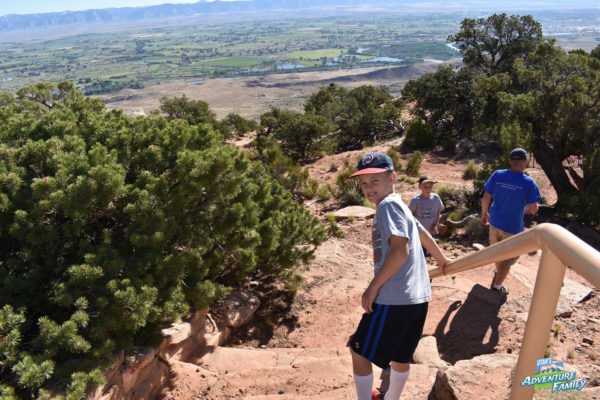 Our boys participate in the Junior Ranger program. We printed the booklet out beforehand, and worked on them as we drove to the Visitor Center. 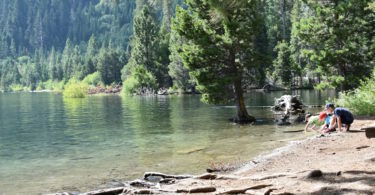 A hike is required to complete this program and earn the badge. The Visitor Center has some great exhibits. 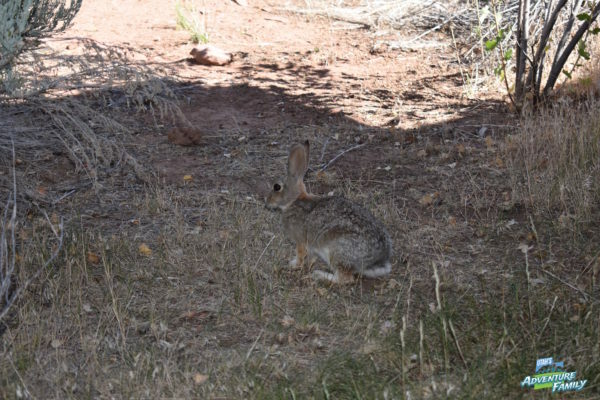 We spotted this bunny right by the Visitor Center. 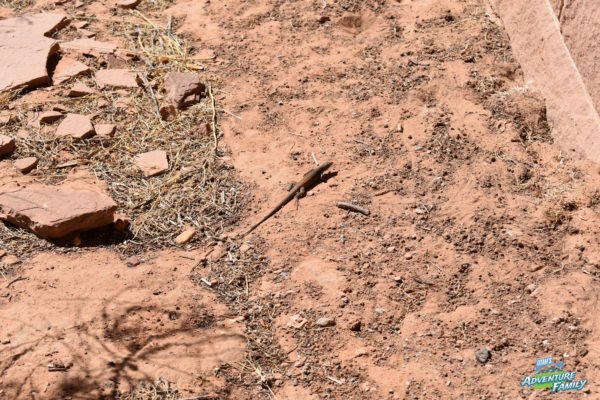 There are lizards all over Colorado National Monument. 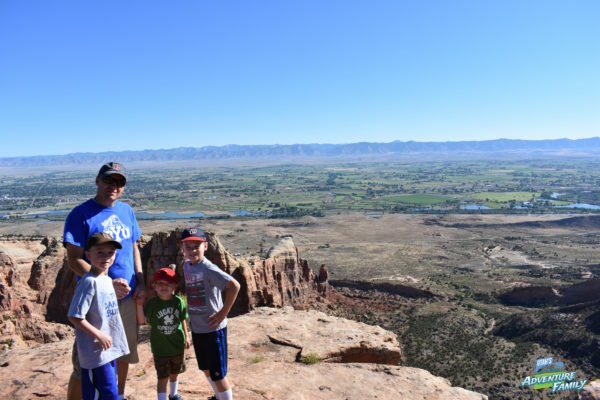 There are many places to stop and look into different valleys and canyons, and the view back over Grand Junction is beautiful. We enjoyed the scenic drive almost as much as the hike. We stopped at one overlook called Fallen Rock. 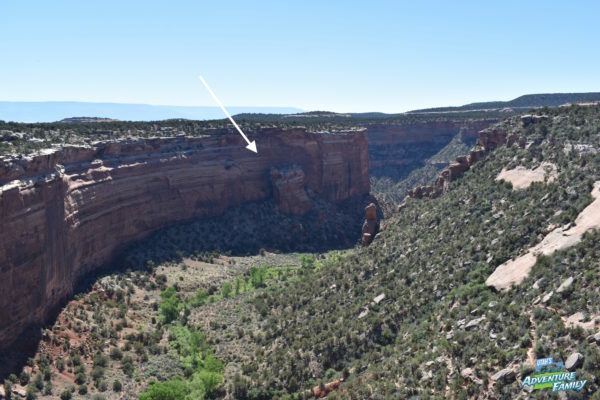 There is a section of rock that has fallen down and still sits in the canyon. 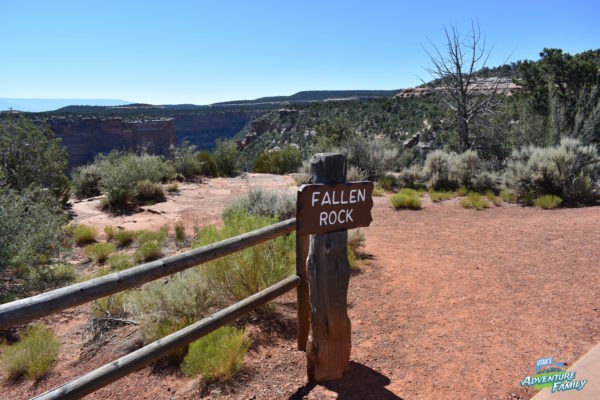 This is one of the stops along the road through Colorado National Monument. See the fallen rock? It matches perfectly with the canyon wall. Finally, the road drops down off the mesa almost as steeply as it climbed up. 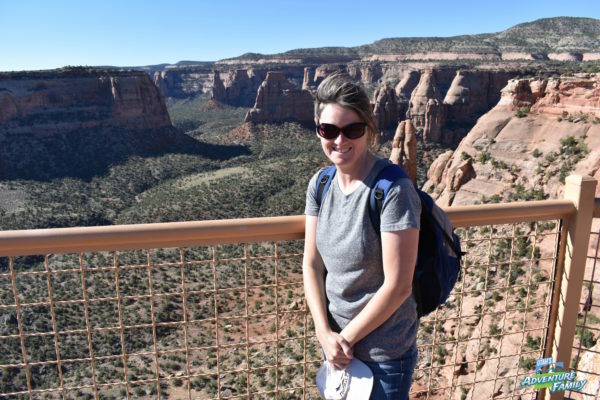 Though we only spent a few hours at Colorado National Monument, we can’t wait to go back and spend a full day exploring. We had a really great time. Colorado National Monument really impressed us. We can’t wait to return for another visit.